Marxism is a political and economic philosophy based on materialist conception of history - initially created by Karl Marx and Friedrich Engels. 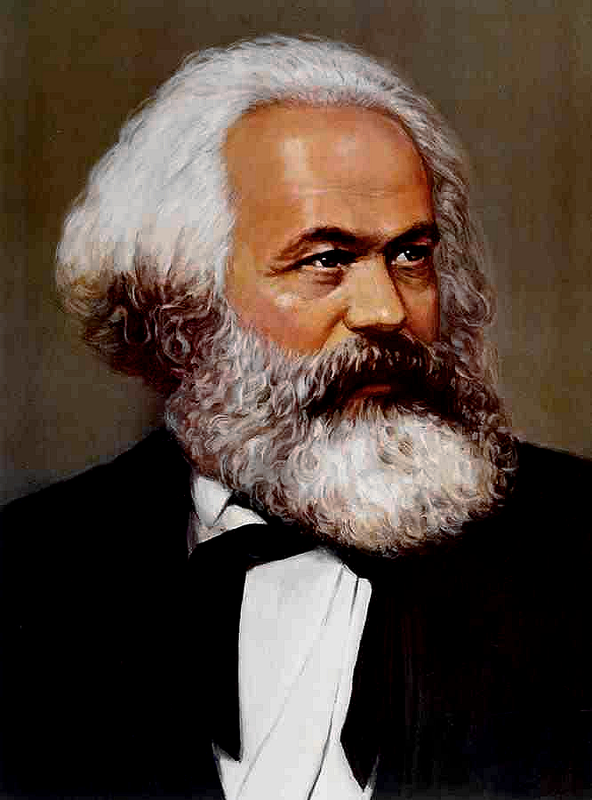 It is principally a theory of history according to which the material conditions of a society's mode of production (its way of producing and reproducing the means of human existence - in Marxist terms, the union of its productive capacity and social relations of production) fundamentally determine its organization and development. Historical materialism looks for the causes of developments and changes in human society in the means by which humans collectively produce the necessities of life. Social classes and the relationship between them, along with the political structures and ways of thinking in society, are founded on and reflect contemporary economic activity. Since Marx's time, the theory has been modified and expanded by Marxist writers. However, production does not get carried out in the abstract, or by entering into arbitrary or random relations chosen at will. Human beings collectively work on nature but do not do the same work; there is a division of labor in which people not only do different jobs, but according to Marxist theory, some people live off the fruits of others' labor by owning the means of production. How this is accomplished depends on the type of society. Production is carried out through very definite relations between people. And, in turn, these production relations are determined by the level and character of the productive forces that are present at any given time in history. For Marx, productive forces refer to the means of production such as the tools, instruments, technology, land, raw materials, and human knowledge and abilities in terms of using these means of production. Marxists expected that socialism would bring material abundance. In real terms this meant not only enough food for everyone, but also clothes, medical care, education, the arts and entertainment, and above all homes, and all the things that go to make a home - consumer goods. It was therefore expected that the state would provide the best designers, and of course the best designs, with regard to consumer goods. 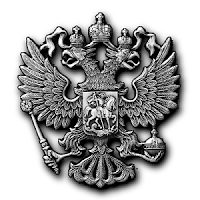 But in addition, while these designs should outshine and outperform the products from the West, and particularly America, they should also be imbued with, and project a sense of, ideologically correct, Soviet life. 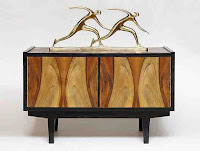 As Soviet-made products often follow the same design styles as many Western objects of the same period, it may seem difficult to find a certain design ideology behind them or to pinpoint the specifically Socialist qualities of such designs design. The main characteristics of Soviet design ideology, however, are not located in the form of the objects, but rather in their mode of production. Despite the different control mechanisms, there was no centralized organ responsible for industrial design and products were judged mostly on economic or technological grounds. While there were many books and articles on Soviet design and design ideology, none of them actually discuss the questions of form, but rather deal with economics and the purpose of design. Therefore, designers had a certain degree of artistic freedom, and were able to follow what they considered to be 'modern trends'. The ideological qualities of design were hidden rather in the physical and ideological context of production, adding a Socialist quality to all Soviet-made objects. 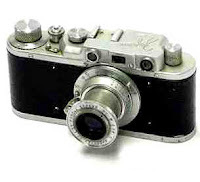 If we look at items mass-produced in the Soviet Union during late Socialism, it can almost be surprising how similar some of them are to the Western-made objects. 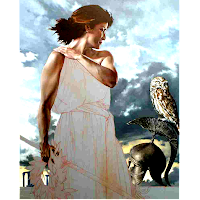 Often, stylistically, they follow the same traditions, and occasionally even copy specific Western objects. Therefore, the nature of Soviet design ideology and their accordance with Socialist ideals may seem unclear at a first glance. The main aspect that was stressed in producing consumer goods was the rigorous control to which industrial design was subjected. Each new product had to be mandated from above by a formal document called a prikaz (order), which announced a decision. No object could go into production without passing an evaluation by the Art Council, comprised of specialists. Different standards were created to ensure that the quality of design throughout the Soviet Union would be on an equally high level, however, design was not properly centralized. There was no bureaucratic institution directly responsible for design. Therefore, bureaucracy related to industrial design was even more complicated than usual in the Soviet context, belonging to several spheres at once. Yet, the ideological factor was the existence of the system of control, not the control itself. Most decisions were based on economic and aesthetic considerations, not ideological. The reason why there was an ideological quality in Soviet design was not just the existence of texts considering it, but also the fact that the Soviet government tried to cover every aspect of life with ideology. It was unthinkable that any detail in everyday life would be ideologically neutral, as by Marxist-Leninist standards everything was ideologically charged. Designers were supposed to be the carriers of Soviet ideology: much like everyone else in the cultural field, they had to contribute to the making of a new Socialist environment. Design was not just the object of control, but also actively used as an instrument for exercising control. For example, furniture was often designed in a way that its arrangement, especially in new flats, was almost completely predetermined. In this way, the state had another tool for controlling and shaping the Soviet citizens. It is important to stress that, in the Soviet context, design was viewed differently to the way it was viewed in the West. Therefore, design was just a tool used for the ultimate goal, never the objective itself. Here, design in its broadest sense could be compared to technology, and the debates surrounding technology at the beginning of the 20th century. This quote actually explains the readiness to adopt Western design influences. Socialism was never intended to negate its capitalist past, but rather to take everything valuable from that experience and build a new system on that foundation. After all, the problem socialism had with capitalism was not based on technological grounds, but social. Adopting Western design styles is merely an example of the same tendencies. The idea and appearance of 'modernism' went very well with the Soviet ideology: 'modern' objects were simple, functional and easy to produce in factory conditions. 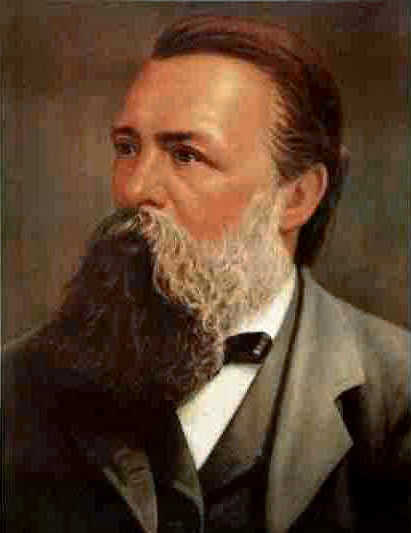 Some of the Soviet ideologues even claimed that, in fact, 'modernism' clashed with the capitalist ideology; for example, Karl Kantor argued that modernism was caused by a protest against private property and “bourgeois individualism”. Often, references were made to the Bauhaus, and its opposition to National Socialism, - however, these theories often seemed to be excuses. As the designers were already influenced by Western trends, and aiming to keep up with the rest of the world, it was necessary to justify this behavior. Design ideologies offered very few guidelines about the ideal Soviet form, or how exactly was it supposed to contribute to the aesthetic education. With reference to the book “Artistic construction of industrial objects”, written by the Russian design philosopher Yuri Somov - the book mostly discusses the importance of economic considerations. Somov preaches rationalism, even claiming that throughout the history, the objects of best artistic quality are created with the minimum use of decorative means. Somov does not advocate Western design, instead he accuses functionalism of lacking a “human factor” without explaining its differences from the economic-rational approach he teaches. Therefore, it is only logical that the “human factor” is added solely by the Socialist environment of production, and it is the surrounding ideology that somehow validates the design ideology. It was officially maintained that in the West, people liked the right things, but for the wrong reasons (?). This treatment is due to the complex nature of ideology as such. It consisted not only of the object, but also of its production, reception and textual justification. If some of the elements vary, the outcome of the ideology itself is different. Therefore, in order to fully understand design ideology, it is necessary to also look at ways design is produced and received. In Soviet context these material practices differ greatly from those in the West, thus further adding to the different layers of ideology. Design was already ideologically correct because of the way it was produced. Art and craft were less subjected direct state control, and therefore include a certain moment of rebellion against the system. Mass-produced design, however, already involves numerous people in its production; it is also produced in a factory that, in USSR, belongs to the state itself. The factory as an ideologically correct location, with the participation of a large number of people (especially as many of them were probably members of the Communist Party) validates the object itself. The fact that something has been produced in a factory already shows accordance with the system. 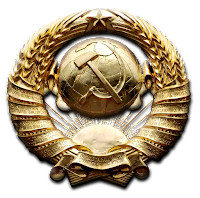 However, the nature of Soviet design ideology remained unclear, as these factors were not enough to form a clear doctrine. This problem was caused by several different factors: the complex status of design within the Soviet society, the lack of a consensus between different ideologues and, most importantly, a lack of a definite visually distinguishable 'aesthetic style'. For designers, it was naturally beneficial, as it meant less control, and more artistic freedom. Most restrictions were technological and economic, leaving design aesthetics to evolve on their own. The context and the environment 'ideologized' the industrial design, regardless of its form. 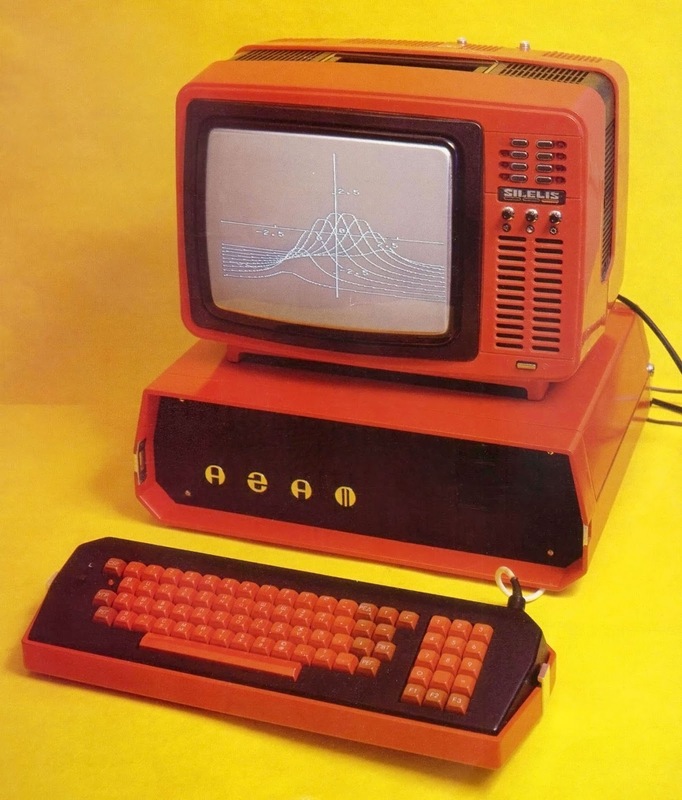 Soviet design often followed the same trends as Western design, although it was a few years behind and often tended to be technologically inferior. In some cases designs were, to a great extent, actually copied. Such examples are the Tupelev airliner, which was copied from the Boeing Stratocruiser, and many of the ZiL limosines, which were copied from American Packard automobile designs. 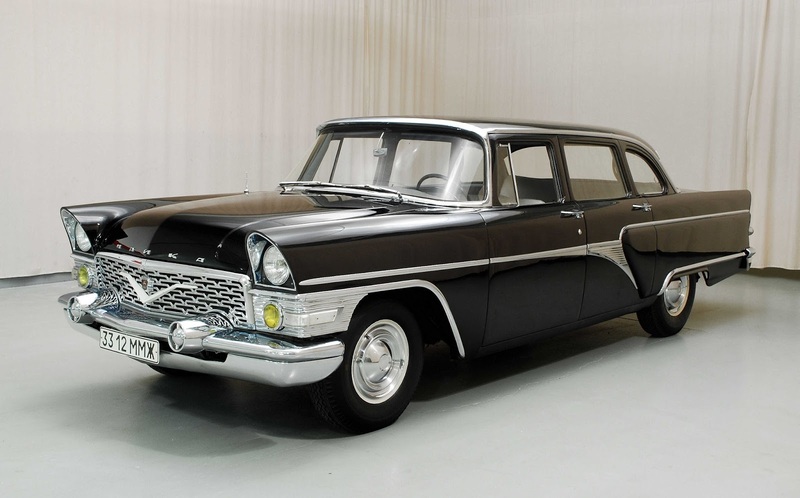 An example of Soviet copying of Western style were the ZiL and the GAZ automobiles. AMO ZiL, (Russian "Zavod imeni Likhachova"), or the Moscow Joint-Stock Company "Likhachov Plant", and more commonly called ZiL Likhachov Plant, (literally "Plant named for Likhachov") is a major Russian automobile, manufacturer based in the city of Moscow, Russia. ZiL has also produced armored cars for most Soviet leaders moddlesd on the American Packard. 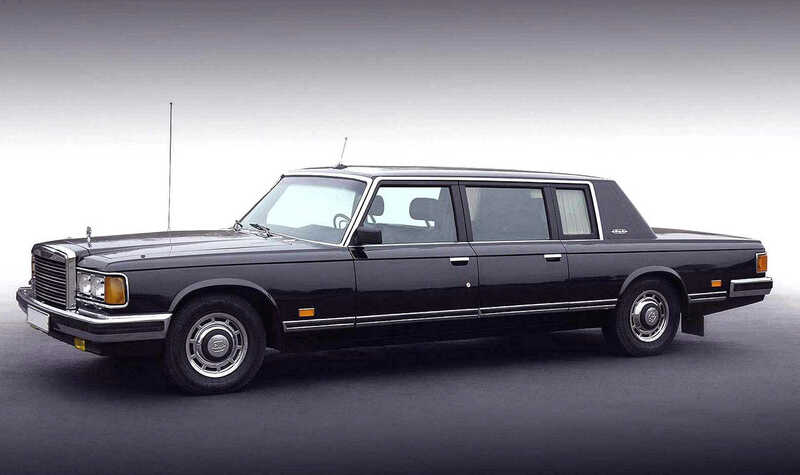 ZiL passenger cars were priced at the equivalent of models by Maybach and Rolls-Royce, but are largely unknown outside the Commonwealth of Independent States, and production now rarely exceeds a dozen cars per year. It was standard practice for officials above a certain level to be driven to and from work by a chauffeur. Often these government cars and their drivers were also available for use outside working hours, though this was not officially sanctioned. The make of car varied according to the rank of the official. It is important to stress that in the Soviet context, the Socialist ideas were hidden in the context and practices surrounding designs, rather than in the actual forms of designs. Design was ultimately intended to be a tool for conveying a message. 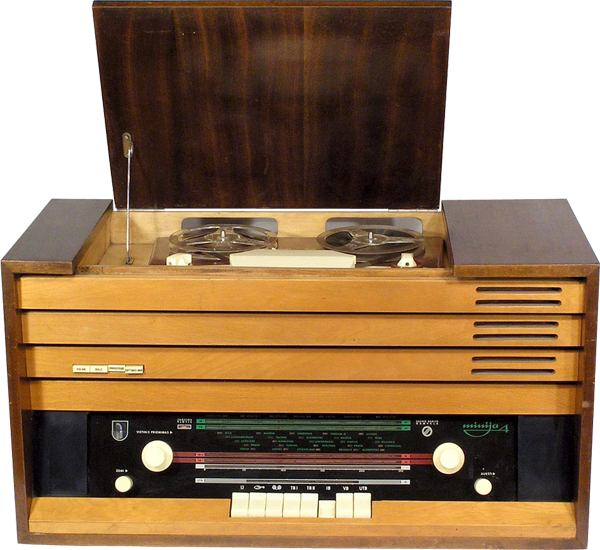 In spite of the various control mechanisms, the Soviet system, however, lacked a specific centralized organ in charge of industrial design, and products were judged mostly on economic or technological grounds. 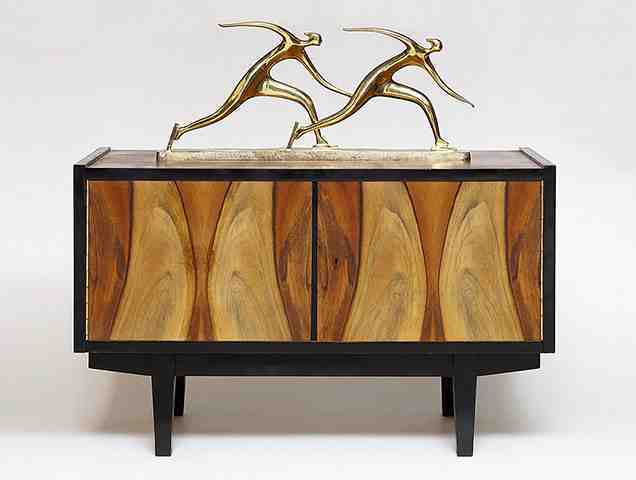 Therefore, designers had some artistic freedom and were able to follow modern traditions. 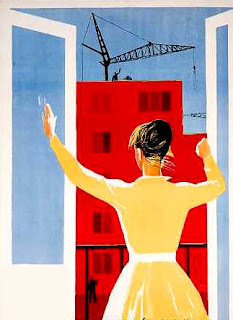 There were two reasons for accepting modernism in Soviet ideology: firstly, because modern objects were easy to produce in factory conditions, and secondly, because there was never a clear definition of Soviet form. The main Socialist factor that makes design produced in the Soviet Union acceptable within Socialist ideology is the surrounding ideology. Industrial design depended on the state, and was located within the general system of control, being both the agent and the subject of control. Also the direct production environment of industrial design was the factory as the most ideologically charged context in the Socialist environment. In practice the degree to which ideology influenced or was reflected in design mattered very little. With regard to the impact of designed consumer goods in everyday life, things were complicated. In the towns, private trade and private businesses were closed down by the Soviet government. The state then took over distribution, as part of a new system of centralized state economic planning, that was vastly ambitious but poorly thought out. Planning was seen in 'heroic', terms as the conquest of hitherto uncontrollable economic forces. The planning process had an immediate objective, which was to carry out rapid industrialization, particularly in underdeveloped regions of the country, according to the First Five-Year Plan (1929-32). That involved massive investment in heavy industry, skimping in the area of consumer goods, and involving substantial involuntary sacrifices of living standards by the general population to pay for it all. It had been the leaders’ hope that the peasantry could be made to pay most of the costs of industrialization; the collectivization of peasant agriculture that accompanied the First Five-Year Plan was intended to achieve this effect by forcing peasants to accept low state prices for their goods. But that hope was disappointed, and the urban population ended up bearing a considerable part of the burden. Marxists as we have pointed out before, had expected that socialism would bring abundance. Under Soviet conditions, however, socialism and scarcity turned out to be inextricably linked. For Soviet citizens, the state, of course, was a central and ubiquitous presence. In the first place, it was the formal distributor of goods, and the near-monopolistic producer of them, so that even the black market dealt largely in state products, and relied heavily on state connections. In the second place, all urban citizens worked for the state, whether they were workers or typists or teachers or shop assistants: there were virtually no alternative employers. In the third place, the state was a tireless regulator of life, issuing and demanding an endless stream of documents and permits without which even the simplest daily tasks could not be accomplished. It is important to note here that Stalin’s revolution ushered in an era of scarcity, and distribution itself became a central bureaucratic task, and the dominant preoccupation of the party leaders. The new importance of things and their distribution was reflected in everyday language. In the 1930s, people no longer talked about 'buying' something, - as consumers do in the West - but about 'getting hold of' it. The phrase 'hard to get hold of' was in constant use; a newly popular term for all the things that were hard to get hold of was 'deficit goods'. People went round with string bags in their pockets, on the off chance they were able to get hold of some 'deficit goods'. If they saw a queue, they quickly joined it, inquiring what goods were on offer after securing a place. But public access to goods through regular distribution channels was so unreliable that a whole vocabulary sprung up to describe the alternatives. It might be possible to get the goods informally or under the counter ('on the left') if one had 'acquaintances and connections', or 'pull' with the right people. For some, however, there were ways round these problems - ways which became more common after the 'Great Patriotic War'. For those favopured by the party there was rationing and so-called 'closed distribution'. Rationing meant distributing limited quantities of goods on presentation of ration cards along with money payment. Closed distribution meant that goods were distributed at the workplace through closed stores to which only employees or persons on the list were admitted. In a longer perspective, it can be seen that this was the beginning of a system of hierarchically differentiated access to consumer goods that became a permanent feature of Soviet trade, and a stratifier of Soviet society. Both rationing and 'closed distribution' were improvisations in the face of economic crisis, - and not policies adopted for ideological reasons. It was true, some enthusiastic Marxist theorists revived the old Civil War arguments that rationing was precisely the form of distribution that was appropriate to socialism. The party leaders, however, had little sympathy for this line of reasoning. They felt rationing was something to be ashamed of, an indication of state poverty, and economic crisis. Despite the leaders’ lack of enthusiasm for rationing, it was so frequently practiced that it may be regarded as the default option of Stalinist distribution. 'Closed distribution' , however, appealed to local officials and elites, but not the rest of the population, because it guaranteed those elites their own privileged access to scarce goods. 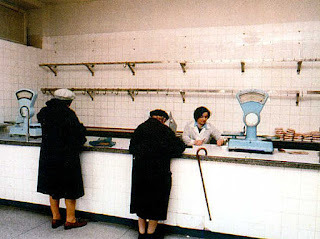 'Closed distribution' was the distribution of rationed goods at the workplace through 'closed stores' and 'cafeterias' accessible only to certain registered workers at that enterprise. It developed along with the rationing system, coexisting with the 'open distribution' network of state stores accessible to the public as a whole. There was a total of about 40,000 stores at the beginning of 1932, constituting almost a third of all retail outlets in urban areas. The concentration of supply at the workplace was increased by the expansion of 'enterprise cafeterias', where workers had their hot meal of the day. By July 1933, two-thirds of the population of Moscow and 58 percent of the population of Leningrad were served by them. 'Closed distribution' was meant to protect the working population from the worst consequences of shortages and link rations to employment. But it also quickly developed another function, which was to provide privileged supply for certain categories of privileged people. Special closed distributors were established for various elite categories of officials and professionals, supplying them with much higher-quality goods than were available in the normal closed stores and enterprise cafeterias. Foreigners working in the Soviet Union had their own closed distribution system, known as 'Insnab'. These developments obviously affected the design of consumer goods. As people did not have the option of choosing what goods to buy - and often bought goods simply because they were available - there was no 'feedback' to the manufacturers and designers from the consumers - as there was in the West. In the West it was often the case that a poor, unattractive or 'old-fashioned' design simply would not sell - and was subsequently withdrawn from the market. In the Soviet Union, however, consumers did not have the option to reject goods, and would usually buy whatever was on offer. So the Russian people were faced with the promise that: 'in the future, there would be abundance' - but for their present, there was scarcity. For the privileged, however, - high party member, government officials, intellectuals and the intelligentsia, there was a certain level of 'abundance'. Privilege, in Stalin’s Russia, had more to do with access - the ability to obtain goods, services, apartments, and so on - than it did with ownership. The key factor in the emergence of an institutionalized hierarchy of access in the 1930s was scarcity, particularly the structures generated by extreme scarcity at the beginning of the decade. This period not only saw the reintroduction of rationing (see above), which had its own internal differentiation, but also of various forms of 'closed distribution' of goods (previously referred to) to those in special categories. The reason for this was not ideological (the ideology of the period tended to be egalitarian and militant) but practical: there was simply not enough to go round. Food privileges took a number of forms: 'special rations', 'special elite closed stores', and 'special cafeterias' at the workplace. It was normal for senior party and government officials received (not buy) special rations. in a system that was internally differentiated. Writers came next, being allocated 400 'academic rations', and later an additional 200 rations were allocated to artists. 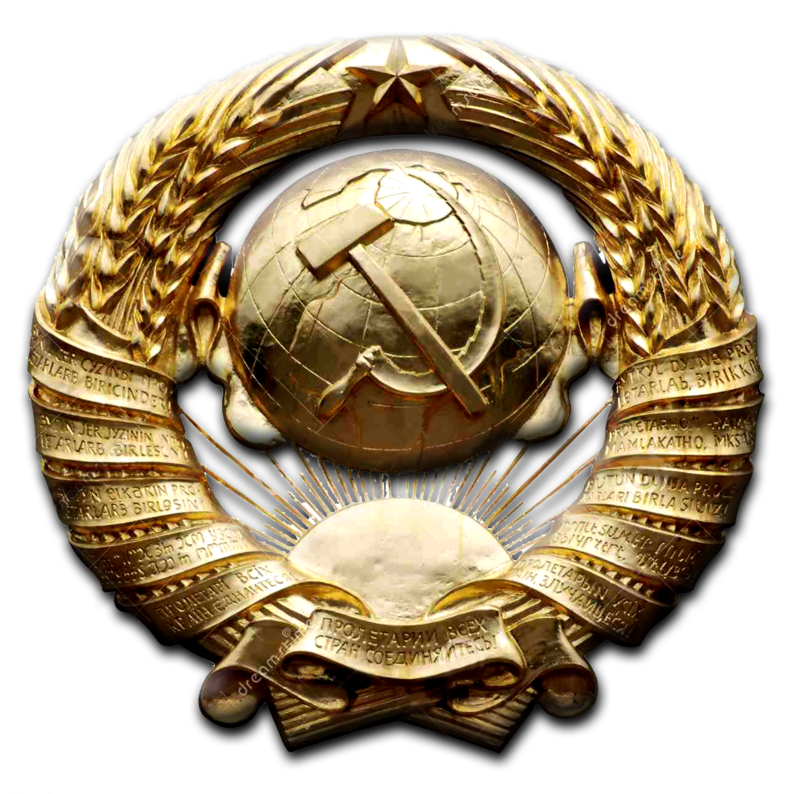 The fact that the amenities of life - car, apartment, dacha - were not owned but were state issue was very important in enabling Communists of the 'nomenclatura' to see themselves as something different from simply a new nobility or ruling class. On the contrary, they were people who owned nothing. Even their furniture was the state’s, not chosen by them but, simply issued, each piece with a small gold oval with a number attached with two nails. It was comparatively easy for elite members to see themselves as indifferent to material things when there was no personal property at stake. 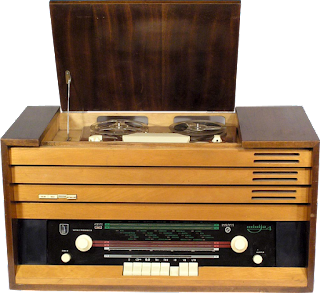 What individuals were given they simply accepted, gratefully, without any consideration of the design, functionality or suitability of the consumer durables in question - and this, of course, meant that there was little to encourage designers and manufacturers to improve their products. Then there was the question of whether the consumer durables provided for the privileged were luxuries. 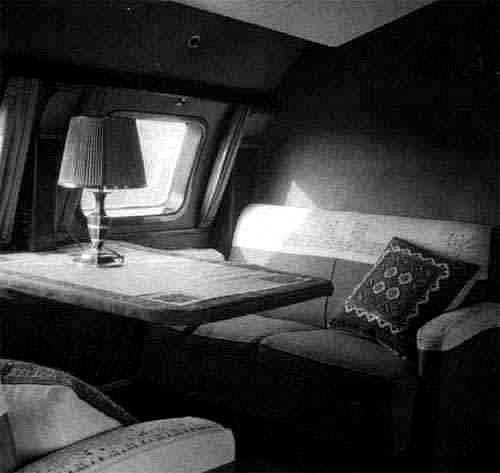 Luxury, as the 'Great Soviet Encyclopedia' “authoritatively explained,” was a relative concept. “With the growth of productive forces, luxury items may become necessities,” and that was exactly what was happening in the Soviet Union. Stalin made his contribution to this mis-recognition by appropriating the term “intelligentsia” to describe Soviet elites as a whole, thus implicitly conferring on Communist officials the cultural superiority of academicians and writers. This conflation of the elites of power and culture was not mere sleight of hand, but conveyed something important about the Soviet mindset. It meant that the social hierarchy was conceptualized in cultural terms. Thus, the Soviet “intelligentsia”, in Stalin’s broad definition, was privileged not because it was a ruling class, or an elite status group, but because it was the most cultured, advanced group in society. It was privileged as a cultural vanguard - and so were the Stakhanovites, whose share in privilege indicated that privilege was not a corollary of elite status. Workers and peasants who had joined the 'intelligentsia' via affirmative action added another facet to the vanguard image, for they, like the Stakhanovites, were forerunners in the masses’ upward march toward culture. The Stakhanovite movement began during the Soviet second 5-year plan in 1935 as a new stage of socialist competition. The Stakhanovite movement took its name from Aleksei Grigorievich Stakhanov, who had mined 102 tons of coal in less than 6 hours (14 times his quota) on 31 August 1935. However, Stakhanovite followers would soon "break" his record. The Stakhanovite movement, supported and led by the Communist Party, soon spread over other industries of the Soviet Union. The press, literature and films praised Stakhanov and other "model workers", urging other workers to emulate their heroic examples. 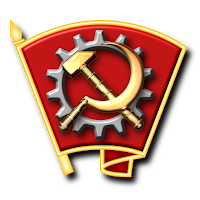 The achievements of Stakhanovites served as an argument in favor of increasing work quotas. To say Stakhanovites had privileges is almost a tautology. It was the function of Stakhanovites, as chosen representatives of ordinary people, to be the visible recipients of privilege. They received much the same range of privileges as the political and cultural elites (extra rations, housing, special resort places, priority access of all kinds, and even automobiles). In addition, however, Stakhanovites were often rewarded directly with consumer goods, from lengths of cloth and sewing machines to gramophones and cars. An important part of the ritual of Stakhanovite conferences, especially those for peasants, was for happy Stakhanovites to give a list of the goods they had been awarded. The function of these awards of material goods was not just to make the Stakhanovites richer and happier, but also to make them more cultured. Often the quality of culture was inherent in the gift itself.